The iPad mini, announced on October 23, has finally arrived at TNW Australia HQ (that is, my house) and we’ve spent a bit of time with the device taking our initial impressions. The thing that struck me most about the iPad mini was its size. At 7.9″ it’s a bit bigger than the handheld tablets that made it to market earlier at 7″ and the comparison shots against a full-size iPad made it easy to feel as though the size difference wasn’t marked enough to bother with the smaller product. But in person, holding the mini in your hand, it’s all too clear just how perfectly sized the device is. The promo shots showing the device being held look as if the model is having to stretch to keep it in place, but that’s not the case. It’s a comfortable fit, and while it is obviously going to be less comfortable than holding an iPhone in the palm of your hand, it’s a huge improvement for many tablet-centric activities such as reading books, flicking through email and surfing the web. It strikes just the right balance. The screen is not a retina display, though it does look better than my reference device, an iPad 2. This is not unexpected given that the iPad mini has the same resolution as the iPad 2 on a smaller screen. iPad 3 owners who’d find it hard to go back may want to wait for a future revision — it’s hard to imagine the mini going without retina for long. Straight out of the box, there’s not a lot of software weight bogging the device down, so it ran as snappily as any new iOS product. 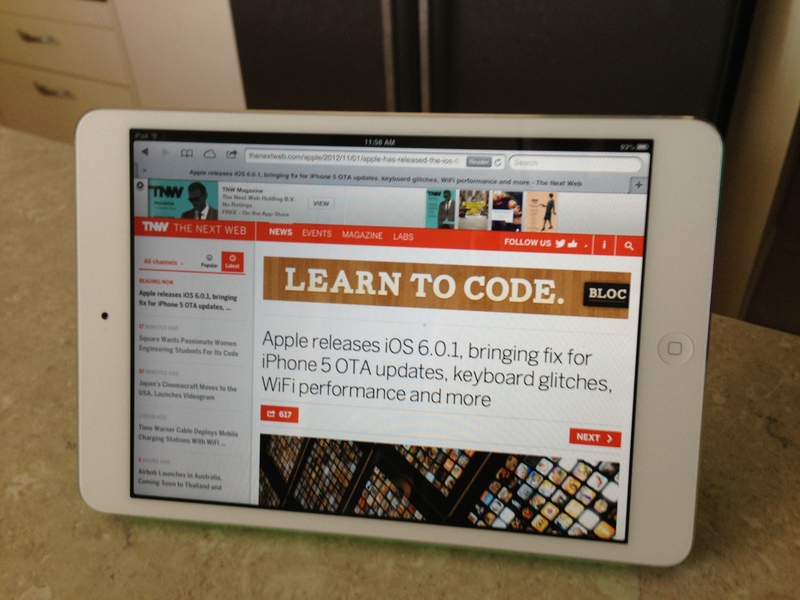 The iPad 2 is still a good performer, though, so there’s no reason to expect less of the iPad mini. The smart cover is nothing new — it’s just smaller. I’d have chosen a different color, though! The device has its downsides. The iPad mini isn’t mini enough to fit in your pocket. While the screen seems better for reading books to my tastes, it’s not going to beat the iPad for TV and movies (not that it’d be a painful experience, as someone who never wants to watch a show on the train using my iPhone again). But that’s why Apple is risking a bigger product line-up with the iPad mini: these are very personal devices, and the use cases for each person is different. This could very well be the tablet for you. Of course, you can get a more detailed look at the iPad mini — we’ve rounded up reviews written by those who received advance review copies of the device.